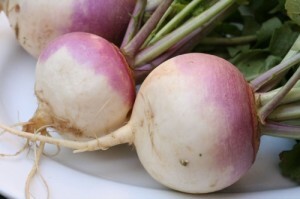 Turnips are a healthy alternative to potatoes. Like the potato, they are considered a starch, but have a third less calories than the potato would. They are loaded with Vitamin C, have fiber, and are low in fat. They also are a good source of magnesium, potassium, and anti-oxidants, which can help lift the body’s immunity along with ridding the body of damaging free radicals. You would be surprised to see how many different recipes discuss how to cook turnips. These turnip fries are mouthwatering and full of flavor, without being full of the calories normal potato fries usually have. They go well with a poultry dish and a side of baked vegetables. Add a nice sparkling glass of wine, and you have the perfect dinner!